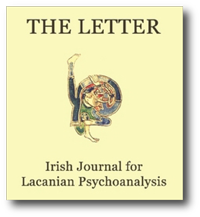 It is not inappropriate that now, when on the one hand psychoanalysis is being questioned once again as to its scientific status and when on the other hand there is in Ireland a great flowering of interest in both the practice and teaching of psychoanalysis, that this issue of The Letter opens with two papers which return to Lacan’s formulations with regard to The Four Fundamental Concepts of Psychoanalysis. Implicit in the first article which appears here, Cormac Gallagher’s commentary on Lacan’s own synopsis of that work, is a question which might well have made a more apt tide for his work, a question which reminds us, in a way which is as pertinent here today as when it was first posed thirty years ago in France, that if one is to have anything to offer to the field of psychoanalysis then certain issues must be faced. And the question: Are you serious about psychoanalysis? At a press conference during the Ecole Freudienne de Paris Congress in Rome in 1974, Jacques Lacan got involved in a question-and-answer session of a type guaranteed to set on edge the teeth of those not uncritically devoted to his cause. Miss X: – Could you specify for us what distinguishes the Ecole Freudienne de Paris from other schools? J. Lacan: – We are serious. That’s the decisive distinction. Miss X: – The other schools are not serious? J. Lacan: – Absolutely not! Cormac Gallagher: I am delighted once again to welcome Dr Charles Melman into our midst. I don’t think it is any exaggeration to say that he has been one of the main forces in psychoanalysis, not just in France but also here in Ireland. He has been coming here since 1987 and has made a major contribution to the work we are doing, – mainly by polarising it and by forcing us to both lift our sights and to keep in touch with what is happening in France and, indeed, throughout the world. On this occasion, what we asked him to do was to talk about Lacan’s seminar on The Four Fundamental Concepts of Psychoanalysis. I don’t know whether Charles Melman was at that particular seminar, – but in any case, he is very close to Lacan’s thought and so we could have no better introduction than his. Charles Melman: I am very glad to meet you again but sorry, once more, because I don’t speak your language. – what is its status? – what is its relationship to myth and to tragedy? – to what extent does it contribute to an understanding of clinical material and therefore to psychopathology? – above all, what is its value in the practice of interpretation? Lacan tells us in The Formations of the Unconscious (1957-58) that Freud, in his search for the Symbolic Origin and the Real Origin of the primitive chain in the history of the subject, finds these origins in his fundamental work A Child Is Being Beaten. Freud has shown that contrary to the general consensus, not that the price we must pay for life is death, but that in fact the reward for death is life. In more accurate Freudian terminology, there is at the beginning of all life fusion/liaison of the libidinal instincts, the life instincts with the death instincts, and that the evolution of the subject involves, at certain stages, the isolation of the death drive. 1. It underlines the permutations of the signifier. 2. It shows the consistency of the Imaginary. 3. It helps to explain the enigma of the desire of the mother. 4. It imposes (or fails to do so) the father as author of the law. It is not the unconscious I seek in your pictures, but the conscious. While in the pictures of the masters…that which interests me…seems mysterious…to me, is precisely the search for unconscious ideas, of an enigmatic order, hidden in the picture, your mystery is manifested outright. The picture is but a mechanism to reveal it. I have been inclined to regard the Surrealists as complete fools, but that young Spaniard with his candid, fanatical eyes and his undeniable technical mastery, has changed my estimate. I would like to raise the question of whether we would be justified in considering the Studies on Hysteria as a writing about psychotherapy since firstly, the authors do not use the term ‘psychoanalysis’ but talk frequently about ‘psychotherapy’, and sometimes about ‘Psychological analysis’ or ‘psychical treatment’, – and since secondly, this publication from 1895 is without a doubt one of the oldest writings on psychotherapy as it is currently used so we cannot ignore it in any historical approach to the subject of psychotherapy. If we agree to this, then what demands are to be met by psychotherapists? A first specification of this question can be formulated as follows: by what are Breuer and Freud possessed in their respective engagement with psychotherapy? By what desire is each motivated as psychotherapist? Are they driven by a desire to cure or by a desire to know? The starting point for their joint publication was the establishment of a rather simple fact, discovered quite by accident, namely the fact that in some cases a symptom can be ‘cured’ or can disappear as a result of the patient talking. Anna O. spoke…and before the eyes of a somewhat perplexed Breuer, she was cured of her hysterical symptoms.